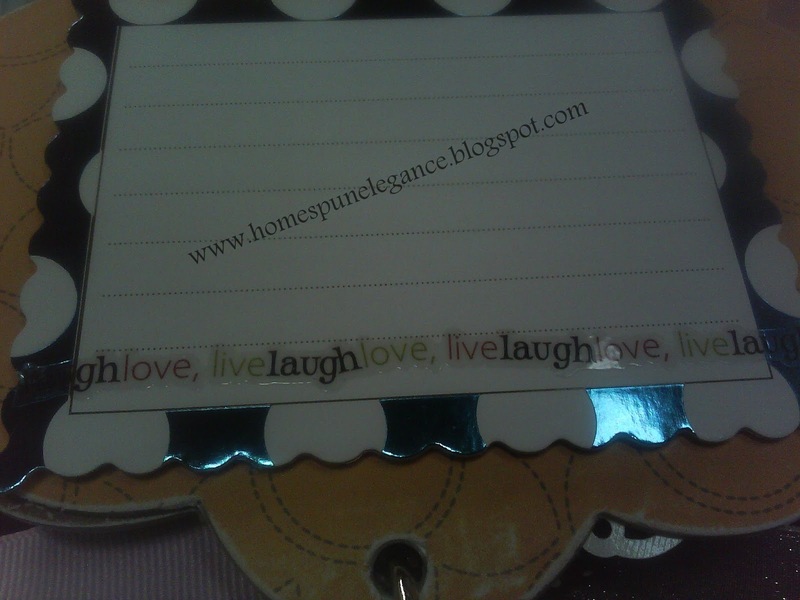 Homespun Elegance: Sunshine, Lollipops and Rainbows Blog Hop! 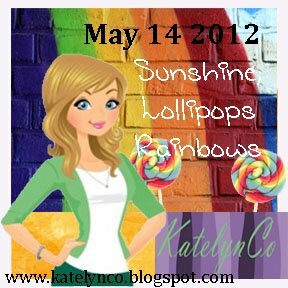 Well, Good Morning everyone, and Welcome to the Sunshine, Lollipops, and Rainbows Blog Hop!! If you just stopped by to check out my blog, be sure not to miss out on any of the inspiration or giveaways by hopping to all the blogs on the line up. 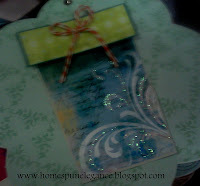 If you came from Helen's Blog, you are in the right spot! This blog hop is in celebration of KateylnCo's birthday with just a little twist from the regular birthday blog hop. We are being inspired by the song written by Lesley Gore, http://www.youtube.com/watch?feature=player_embedded&v=XQmBXEZEYtg. To be entered all you need to do is Hop Today and on each stop along the way leave a comment! You have until Thursday to Hop and KatelynCo will be announcing the winner on Friday! This blog hop is not requiring you to follow each of the blogs, but we'd love it if you joined our blogs. 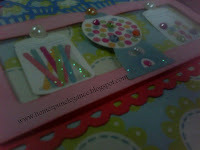 Emma is giving away the Cocktails stamp set from Pink by Design.This set has fruits, glasses, and umbrellas! Perfect for Summer and a very versatile set In Other Words. Just leave a comment on each stop to be entered! Winner will be selected at random! I created a mini album for this hop! 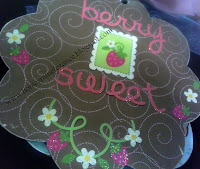 It is for my new and dear friend's Daughter, Mekayli (Me-Kay-Lee). 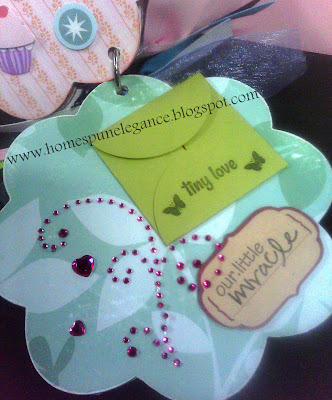 Wandy Pizarro (http://www.greenapplescrapper.blogspot.com/) is Mommy and has been such a treasure since I met her. It was really an off chance, and she had commented on the Easter Baskets that I was doing with Sheffields Place. I responded, and we kept in contact. First, I wanted to show you the cover! Isn't that so sweet! I used my Sew Easy thread and gloobers and wound the thread from the center to the outside and snipped it and burned the edges to prevent fraying. 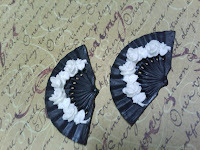 Also, I am doing a fun little giveaway for those that are friends of Homespun Elegance! To be entered, all you have to do is be a Friend! Current and New fans welcome! 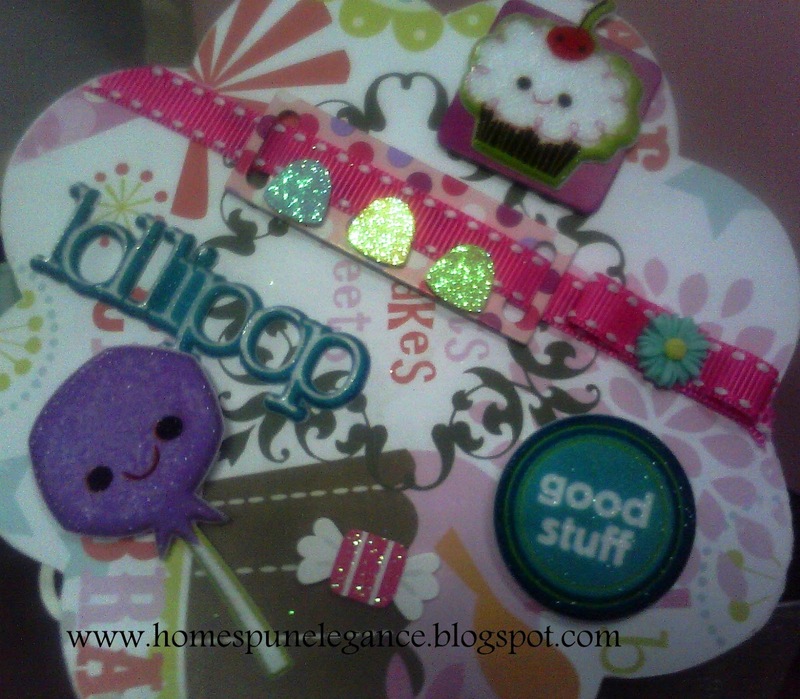 (But remember, to be entered in KatelynCo's candy, you must comment on each person's blog) This giveaway is for a grab bag of Resins from the newest Sponsor of A Homespun Affair, E-zine!! Here are two examples of their resins! Here is the line-up for the Hop in case you get lost along the way. Hop on over to Shannon next! Please make sure to comment on each of their projects today to be entered in our giveaways! Reminder: You have until Thursday to Hop and KatelynCo will be announcing the winner on Friday! so creative........since we can also do it together with the children.. So cute Jessica! I especially love the twine lollipops! adorable! 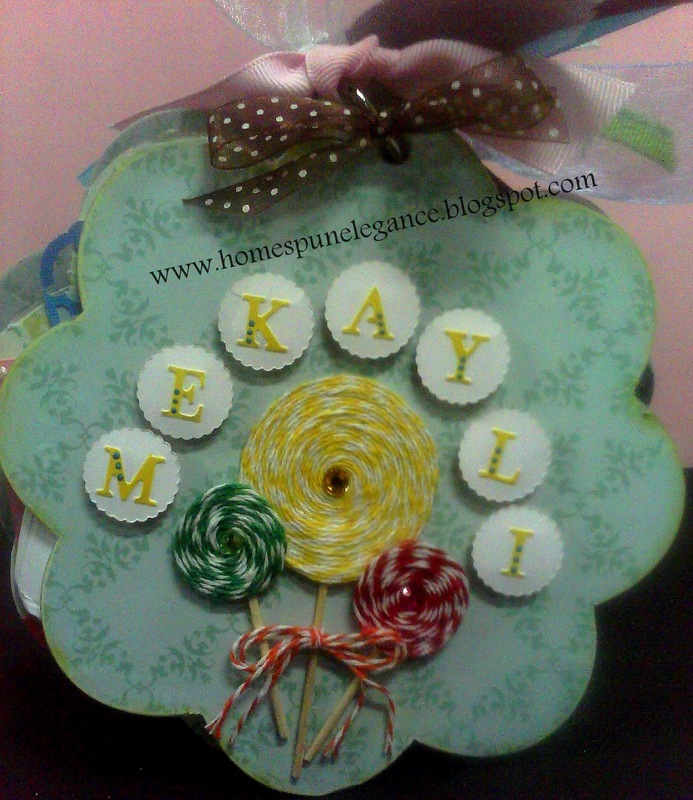 I love how you made the lollipops, they almost look real. This is beautiful Jessica!!! love those lollipops! Your album is so cute!!! :) You are amazing! Awesome Album!!! She will love it! Very sweet! This project is lovely! I'm a new follower. I love the mini album. I just started making mini's!! Jess, Awesome as always!! Love the mini it is so cute. You are very talented and creative. Love your lollipop cover and your mini album shape, so cute. love the twine lollipops! great idea! Jess! Go check out my blog! There is a surprise for you there!! OH EM GEEE!!! I love this Jess! And honored that it's for my daughter! I just adore it thank you for taking the time to make her something so adorable and sweet! Hey Jess! I know I already commented above but I have a surprise for you so check out my blog post for today! Wow your album is so cute. 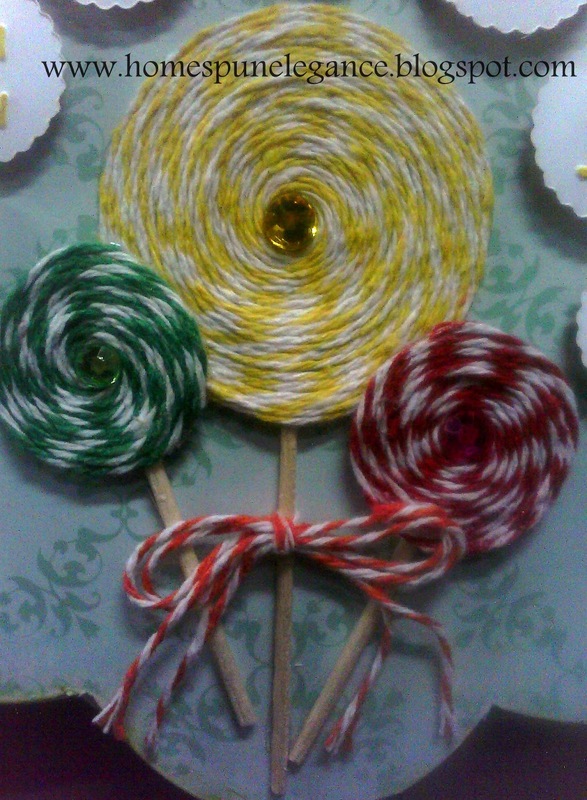 I love how you made the lollipops out of twine. Pretty impressive. The album is impressive as well. Aww that is so supper sweet! I love the twine lollipops! I also like how you create challenges for yourself! Thanks for sharing! 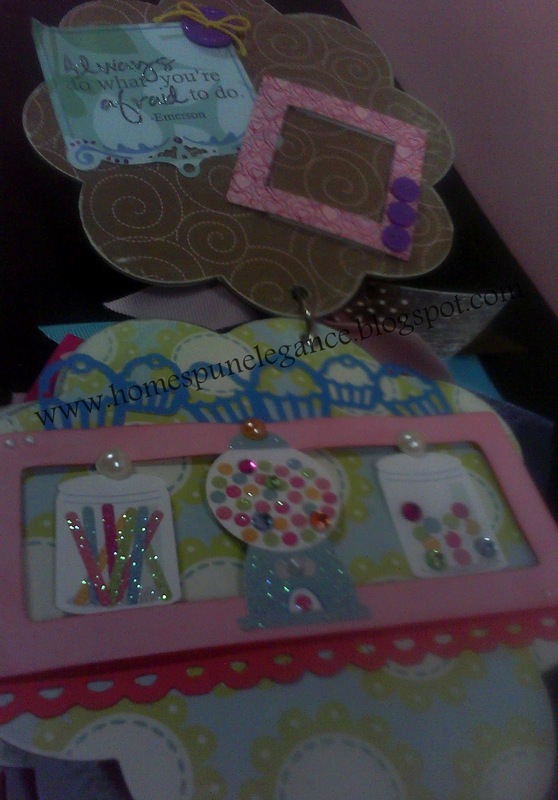 Wow simply stunning work Jessica, especially the lollipops and your pages are beautifully detailed, love it! Thank you everyone! I just got home and was able to jump through! What a great Hop ladies!! And a HUGE tahnk you to everyone that joined us For Lovely Emma's Birthday!! Love it! I gotta get me some of those gloobers!! And the twine??!! Love it! Really Cute, I just love the lollipops! Hi Jessica!! !Love it!Love it!Love it! I hope I win it!You areso creative that it's always a pleasure to visit your blog!!! 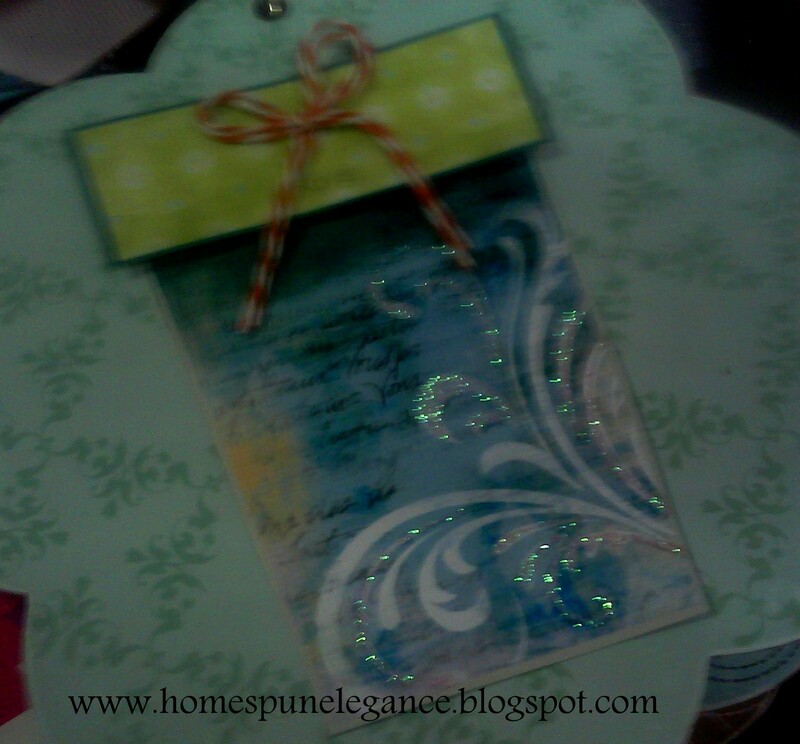 Stace, the Twine is from We R Memory Keepers! ;) About 3 bucks a package of three colors! Great deal! Adorable! I just love mini albums! This is the cutest album!!! 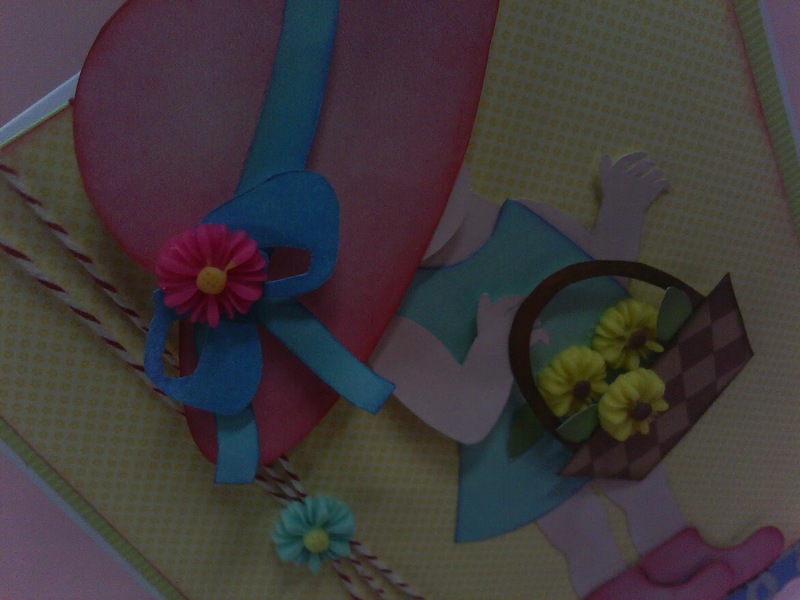 love it and what you did with the twine is super dee duper cute! love it!! Great Blog, I am definitely going to join up! 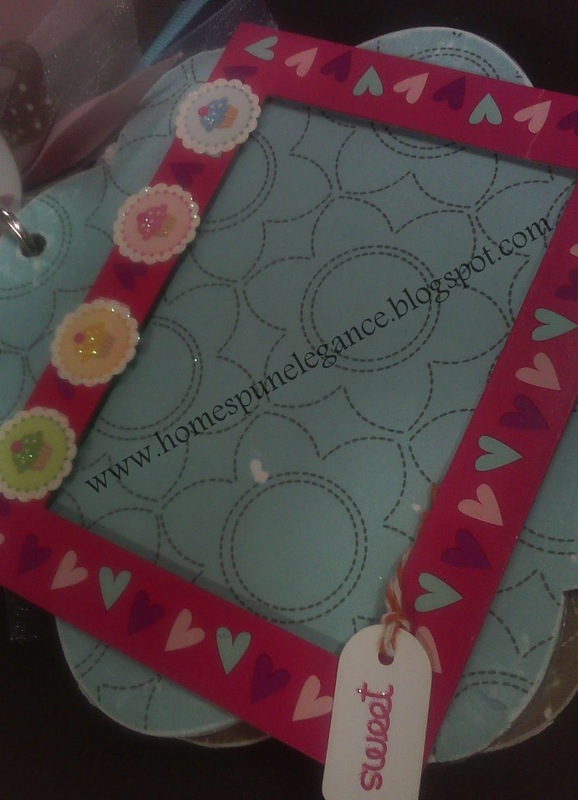 I have just started to get back into crafting and am considering starting my own craft blog. Thanks for the inspiration. Became a facebook follower! Love the album. Love your mini album Jessica!! 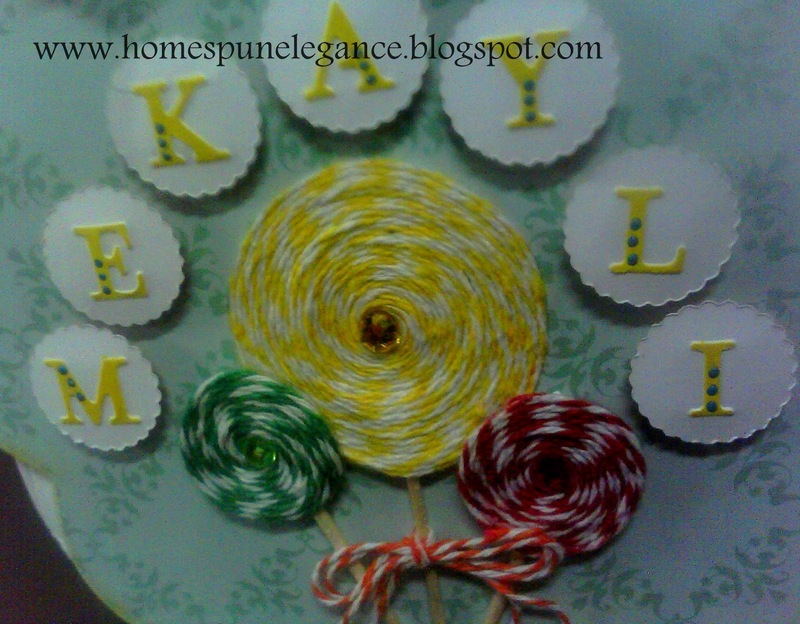 Those twine lollipops are so cute! Your mini album is the cutest! I love all the fun, sweet little embellishments on your pages, and that twine lollipop is adorable! Lots of great inspiration here! I am a new follower!! Those resin embellishments look fabulous! Oh WOW!!!!! This mini album is adorable!! I love the lolipops!! Really I love it all, great mini album!! Oh man I missed the hop! Your project is adorable. love it!